Sandwiched between Brighton & Hastings, the seaside town of Eastbourne is the unlikely outpost and home to future alt-rock heroes, The Late Greats. In equal parts intelligent, intense, chaotic and fragile, the four piece have quietly bided their time over the last 12 months, writing their debut album (in between epic bouts of table tennis) thus honing the sound of The Late Greats. Life Without Balloons is a record indebted to the band’s love of lo-fi US indie/alt-rock (Sonic Youth, Pixies, Pavement) but stamped with a truly provincial, English delivery glittering with melodic gold. Kicking off with ltd edition single Futures Gold (which sold out in two days), the album opens with the immortal line and statement of intent, “HEY! I’m pleased to meet you / and all your stupid faces”. What follows, is nine songs of near pop-perfection: showcasing The Late Greats’ unflinching mix of instant, poppy melodies with uncompromising spikiness and obtuse, heavy heart lyrics. The band’s duel lead vocalists Max Arnold and Ryan Griffiths have the uncanny knack of making the most melancholic of melodies sound uplifting and life affirming. To this affect, The City Swallowed You Whole intersperses a chest rattling moog bass line with sweetly resigned vocals, whilst Surrender’s bittersweet, relationship-in-meltdown lyrics -“I’m about to surrender / take that ribbon off my finger” – belie the overwhelmingly positive sing-a-long chorus. The soaring guitars and heavenly ”ooh-ooh” backing vocals of Quick Fix are perhaps the album’s centre piece. The whole climatic chorus is so maudlin and urgent you can almost feel the sea rain lashing down on Eastbourne at closing time on a cold, drunk Friday night. Touring and gigging over the last year with the likes of Late of the Pier, Blood Red Shoes and Hot Club de Paris has developed the Late Greats into an incredibly tight and thrilling live band. The Late Greats are four young men from Eastbourne who served the usual apprenticeship in a number of underachieving local outfits before taking their name from a Wilco tune and making a real go of it. Finding inspiration in the faded seaside hoardings of their hometown, The Late Greats arrive with a debut packed full of ideas and notions and execute them all rather excellently. Forthcoming single 'Futures Gold' is a collision of tight spiky riffs and hollered vocals while 'Kitty' swaggers along with a distinctly American confidence and 'City Swallows You Whole' rides a surreptitious fuzz synth line before a bruised chorus line sobs 'The city has ways of wearing us down'. Another great marker of the UK music scene 'Life Without Balloons' will gain The Late Greats more than a few new fans. Eastbourne is a place where the hair colour is generally blue and grey, but it seems there might be skinny-jeaned and oblique haired life in the old place. The Late Greats are certainly lively. There's enough Grid-powering energy here all right. Is that enough? Of course not. And that's why, on 'Futures Gold'. The Late Greats are generous and thoughtful enough to supply us with extras like gold tinted riffage and winsome double vocals. 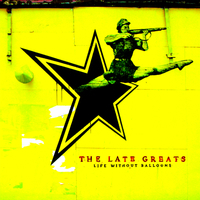 Unfortunately at this time we can't offer all the The Late Greats - Life Without Balloons tracks as individual mp3s, as some of these tracks exceed the shops maximum (9mins) download length.